Well Seasoned Gourmet Food Store has released a gluten-free version of their freshly made and fully pasteurized Ready-To-Eat Cookie Dough in the popular flavour, Classic Chocolate Chip– a true classic that brings back childhood memories. Available for $7.99 in-store at Langley’s Well Seasoned or online (ships Canada-wide), each dough is packaged in a single-serve container with two accompanying wooden spoons. Well Seasoned’s Ready-To-Eat Cookie Dough has been gaining viral attention and are barely staying on the shelves. To meet customer demands, it was only fair to create a gluten-free version so everyone can enjoy. As seen on outlets such as Vancouver is Awesome and The Georgia Straight (and many others), the Ready-To-Eat Cookie Dough is unsurprisingly catching fire all around Vancouver and the Fraser Valley. It also continues to be at the top of each year’s food trends. 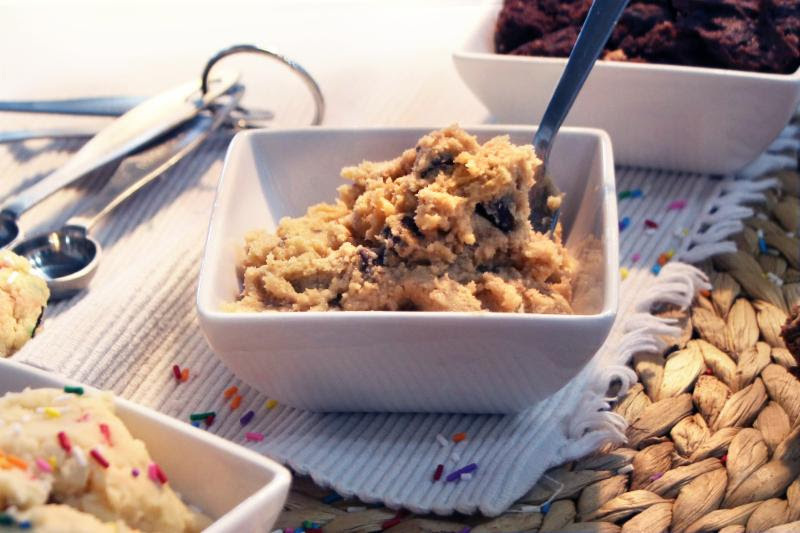 This special Ready-To-Eat Cookie Dough allows food-lovers to safely consume the “raw” dough. 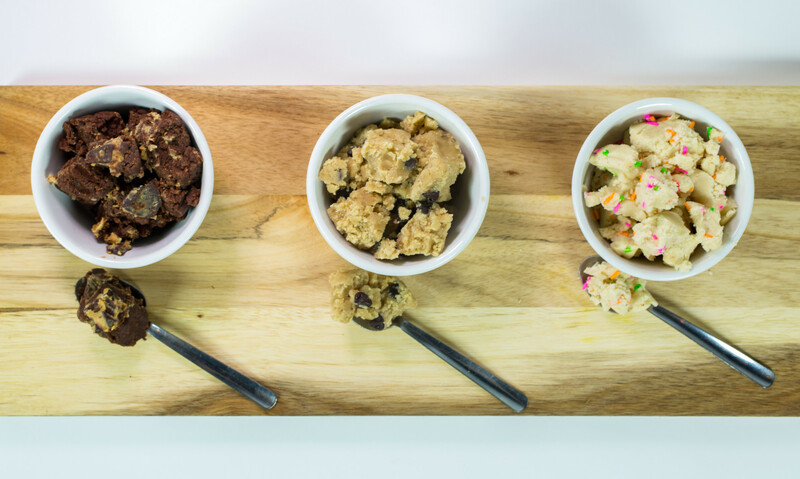 There are no raw eggs or unpasteurized ingredients – these treats are designed to satisfy the cookie dough craving without the risk. Now with the gluten-free recipe, those with dietary restrictions don’t have to take a risk, either. Langley’s Well Seasoned Gourmet Food Store has released a gluten-free version of the Classic Chocolate Chip Ready-To-Eat Cookie Dough. Can I bake the Ready-To-Eat Cookie Dough into cookies? No, our cookie dough is made especially for consuming unbaked. It doesn’t include ingredients necessary for making baked cookies. No, the cookie dough is made with fresh ingredients and immediately frozen or refrigerated. Ready-To-Eat Cookie Dough will last up to 10 days at room temperature or 6 weeks in the refrigerator. If you would like to save your Ready-To-Eat Cookie Dough for later, it can be frozen for about 1 year. Just thaw it for 20-30 minutes and it will be ready to eat again. Is your cookie dough safe to eat raw? Yes, all of the ingredients in our homemade recipes are safe to consume unbaked. Well Seasoned, owned by Angie Quaale, is a Langley-based gourmet food store, founded in 2004, and specializing in international and local hard-to-find specialty ingredients, spices, cookware and condiments. With a passion for fine food, Well Seasoned is a food lover’s one-stop paradise for fresh culinary delights featuring local artisan producers, weekly in-store cooking classes with renowned chefs, educational seminars, and insights into the most cutting-edge food trends and products. Well Seasoned’s website also offers weekly new recipes for every home cook. For more information on Well Seasoned, please visit wellseasoned.ca or call 604-530-1518.